When selecting a new skateboard, there is always a balance to consider: cost, quality and performance. On top of that, selecting a board that is appropriate for both the types of tricks you wish to perform as well as your skill level is also important. If you fail to research these areas thoroughly, you may find that your board is not the best skateboard for what was envisioned and this could lead to a disappointing purchase. Fortunately enough, there are hundreds of quality skateboards out there that combine quality, versatility and a low price. In our research of maple longboards, we stumbled across the San Diego Speed Maple Longboard, a nice contender with characteristics in all three of the aforementioned categories. This San Diego Speed longboard is a complete skateboard system that prices in the $90 range. The initial reason this board was selected for review was due to its five-star rating on multiple major sites; when a product has 10+ reviews all with 5 stars that always should catch your eye. Nevertheless, online reviews cannot be the sole determining factor in whether or not a skateboard is a good buy, so we ordered one for an evaluation. Let us take a look at the specifications of one of SAN’s newest maple longboards to get an idea of what it entails. Upon jumping on the San Diego Speed longboard, we were impressed with how the concave shape of the deck aided in keeping our feet firmly in place. The overall length of the board allows for greater stability at high speeds, making this a very fast board in the right hands. The soft wheels provide a good grip as does the grip-tape on the deck for your feet, enhancing the stability of the board. Carving and cruising are the strong suits of this board. The deck seems to be very durable and chip-resistant, an advantage when it comes to maple longboards. When it comes to the negatives of the San Diego Speed longboard, we cannot help but feel picky when describing them. The trucks and assembly arrive rather tight on the board, so for most skateboarders this will need to be loosened/adjusted; if you are used to maple longboards, this is no big deal. This board is also not a good slider; the soft wheels play a part in this but even with harder wheels, the overall length of the board makes it difficult to slide in general. That is OK, though, because this is a carver and a cruiser and a good one at that. This San Diego longboard is excellent value and a well-rounded product. When it comes to maple longboards, this one cannot be beaten. We would recommend this skateboard to anyone who is just starting out (as it is very stable) or to anyone who is looking for a durable cruiser. 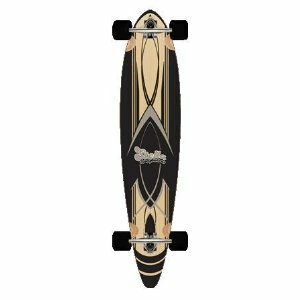 If you have been considering purchasing a new longboard, then the San Diego Speed Maple Longboard may be a good choice for you. This entry was posted in Other, Reviews, Skateboarding, Skateboards and tagged Longboard, Maple, San Diego. Bookmark the permalink.